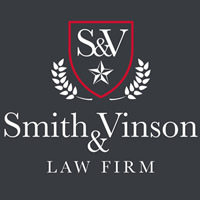 Smith & Vinson Law Firm is a Central Texas DWI and criminal defense firm committed to defending accused citizens. We care about you and will fight to get you the justice you deserve. At Smith & Vinson Law Firm we listen to our clients, seek out the truth, and don't accept what the prosecutor says at face value. We work for you. Smith & Vinson Law Firm is an Austin criminal defense firm committed to defending accused citizens in Travis county, Williamson county, and surrounding areas. Smith & Vinson Law Firm is an Austin criminal defense firm committed to defending accused citizens in Travis county, Williamson county, and surrounding areas. We care about you and will fight to get you the justice you deserve. At Smith & Vinson Law Firm we listen to our clients, seek out the truth, and don't accept what the prosecutor says at face value. We work for you. As a former prosecutor, Jarrod Smith, has tried cases in front of juries, ranging from Driving While Intoxicated (DWI) to theft to burglary of a motor vehicle. Mr. Smith has tried DWI cases with no field sobriety tests, with sobriety tests, and blood DWI cases. He has experience handling bond issues, motion to revoke, and motion to adjudicate hearings. As a prosecutor, he handled hundreds of cases. Mr. Smith has a unique insight into how the police and the government go into building a case against his clients. He can use this experience to help you fight your case. In a time of such turmoil, when all the weight of the government is bearing down against you trying to lock you in a box, you need someone on your team fighting for you, not against you. At Smith & Vinson Law Firm, we listen to our clients, seek out the truth and don't accept what the prosecutor says at face value. We work for you. We fight for you. Attorney Jarrod L. Smith is a native Texan. He believes in the simple principle of fighting for his clients to receive the best possible outcome. Mr. Smith, along with his law partner, Brad Vinson, founded Smith & Vinson Law Firm with the idea of helping accused citizens navigate their way through the complicated criminal justice system. Mr. Smith completed his undergraduate education at the University of Houston, majoring in criminal justice, and graduated with high honors. He went on to attend law school at South Texas College of Law in Houston. Mr. Smith excelled academically, ranking in the top 20% of his class. Mr. Smith also excelled in the courtroom. He completed courses in criminal trial advocacy and mock trial, finishing 1st place, with Brad Vinson, in the Garland Walker Mock Trial competition. Mr. Smith has considerable experience in the area of criminal law. Besides being a former prosecutor, he has interned with the Harris County District Attorney's Office and Harris County Public Defender's Office. Also, Mr. Smith has experience on the federal side of the criminal justice system, as a former law clerk for the United States Attorney's Office. These internships provided him with a variety of practical experience on both the state and federal, prosecution and defense side. As a former prosecutor, he has tried cases in front of juries, ranging from Driving While Intoxicated (DWI) to theft to burglary of a motor vehicle. Mr. Smith has experience handling DWI blood and breath cases. As a prosecutor, he handled hundreds of cases. Mr. Smith has a unique insight into how the police and the government go into building a case against his clients. He can use this experience to help you fight your case. Mr. Smith and his partner, Mr. Vinson, have known each other since the first day of law school. They will work together to help you with your legal issues. They will fight for you. They will work hard to make sure that you receive the best possible resolution to your case. With Smith & Vinson Law Firm, you are not just hiring a lawyer to handle your case, but a firm that will put you and your legal needs first. Mr. Brad Vinson completed his undergraduate education at the University of Tennessee, majoring in communication. During his time at South Texas College of Law, he also completed coursework in criminal trial advocacy and mock trial, finishing first place, along with Jarrod Smith, in the annual Garland Walker Mock Trial competition. Mr. Vinson went on to compete in a variety of mock trial events. He was named Summer Trial Academy Best Advocate Overall and traveled to New York to compete in a national tournament as a varsity advocate in South Texas College of Law's nationally ranked mock trial team.